Note:This is an update to an earlier post, which many found to be too technical. The original, and a series of comments on it, can be found here. See also a more recent post here for an even less technical discussion. Over the last 150 years, carbon dioxide (CO2) concentrations have risen from 280 to nearly 380 parts per million (ppm). The fact that this is due virtually entirely to human activities is so well established that one rarely sees it questioned. Yet it is quite reasonable to ask how we know this. One way that we know that human activities are responsible for the increased CO2 is simply by looking at historical records of human activities. Since the industrial revolution, we have been burning fossil fuels and clearing and burning forested land at an unprecedented rate, and these processes convert organic carbon into CO2. Careful accounting of the amount of fossil fuel that has been extracted and combusted, and how much land clearing has occurred, shows that we have produced far more CO2 than now remains in the atmosphere. The roughly 500 billion metric tons of carbon we have produced is enough to have raised the atmospheric concentration of CO2 to nearly 500 ppm. The concentrations have not reached that level because the ocean and the terrestrial biosphere have the capacity to absorb some of the CO2 we produce. * However, it is the fact that we produce CO2 faster than the ocean and biosphere can absorb it that explains the observed increase. Another, quite independent way that we know that fossil fuel burning and land clearing specifically are responsible for the increase in CO2 in the last 150 years is through the measurement of carbon isotopes. Isotopes are simply different atoms with the same chemical behavior (isotope means “same type”) but with different masses. Carbon is composed of three different isotopes, 14C, 13C and 12C. 12C is the most common. 13C is about 1% of the total. 14C accounts for only about 1 in 1 trillion carbon atoms. CO2 produced from burning fossil fuels or burning forests has quite a different isotopic composition from CO2 in the atmosphere. This is because plants have a preference for the lighter isotopes (12C vs. 13C); thus they have lower 13C/12C ratios. Since fossil fuels are ultimately derived from ancient plants, plants and fossil fuels all have roughly the same 13C/12C ratio – about 2% lower than that of the atmosphere. As CO2 from these materials is released into, and mixes with, the atmosphere, the average 13C/12C ratio of the atmosphere decreases. Isotope geochemists have developed time series of variations in the 14C and 13C concentrations of atmospheric CO2. One of the methods used is to measure the 13C/12C in tree rings, and use this to infer those same ratios in atmospheric CO2. This works because during photosynthesis, trees take up carbon from the atmosphere and lay this carbon down as plant organic material in the form of rings, providing a snapshot of the atmospheric composition of that time. If the ratio of 13C/12C in atmospheric CO2 goes up or down, so does the 13C/12C of the tree rings. This isn’t to say that the tree rings have the same isotopic composition as the atmosphere – as noted above, plants have a preference for the lighter isotopes, but as long as that preference doesn’t change much, the tree-ring changes wiil track the atmospheric changes. In addition to the data from tree rings, there are also of measurements of the 13C/12C ratio in the CO2 trapped in ice cores. The tree ring and ice core data both show that the total change in the 13C/12C ratio of the atmosphere since 1850 is about 0.15%. This sounds very small but is actually very large relative to natural variability. The results show that the full glacial-to-interglacial change in 13C/12C of the atmosphere — which took many thousand years — was about 0.03%, or about 5 times less than that observed in the last 150 years. Stuiver, M., Burk, R. L. and Quay, P. D. 1984. 13C/12C ratios and the transfer of biospheric carbon to the atmosphere. J. Geophys. Res. 89, 11,731-11,748. Francey, R.J., Allison, C.E., Etheridge, D.M., Trudinger, C.M., Enting, I.G., Leuenberger, M., Langenfelds, R.L., Michel, E., Steele, L.P., 1999. A 1000-year high precision record of d13Cin atmospheric CO2. Tellus 51B, 170–193. *How much they can be expected to absorb in the long run is an interesting and important scientific question, discussed in some detail in Chapter 3 of the IPCC report. Clearly, though, it is our ability to produce CO2 faster than the ocean and biosphere can absorb that it is the fundamental cause of the observed increase since pre-industrial times. **The development of continuous series of tree rings going back thousands of years by using trees of overlapping age, is known as dendrochronology (see the Arizona Tree Ring lab web pages for more information on this). ***There is a graph illustrating such sponge data here. Thanks to F. Boehm for providing. You probably saw the review of Crichton’s book in the New Yorker recent issue. It was critical and alarming. I was very pleased to see your web site. It is needed. Thanks I had just read this today. It is a well-written review, and is available on line at the moment even if you don’t subscribe. Weart’s history is quite a remarquable work. It is also well-written and easily accessible for many. I believe that for many people the historical description of how one has come to a particular insight, (for example the question “How do we know Co2-increases are due to human activities”)might be enlightening. Especially in view of the current “debate” where many viewpoints and conclusions are presented by the press as if they came out of a hat. Is there any evidence that carbon dioxide concentrations in the atmosphere, prior to the industrial revolution, ever approached the concentrations that we are seeing now? This is Science, of course! Bravo! I’m especially interested in finding out (1) the extent (volume and mass) of the atmosphere into which the carbon mass was added and (2) the ranges of uncertainty associated with both the extent of the atmosphere and the mass of carbon produced. are not very clear as follows. The addition of carbon into the atmosphere by human activities does not automatically imply that the atmospheric concentration must necessarily increase. Might the natural sinks of carbon at some times be able to absorb the human additions and result in no net increase? I don’t think there is any question that 6 billion living people, and rising, will have some effect on CO2 levels (not to mention CH4 levels). What seems clear, however, is that we don’t know exactly what that effect is. From the article above, the expected rise to 500 ppm hasn’t occurred. Nowhere near. But the precise reasons for the apparent shortfall are not known. So we really can’t say how much of an effect humans are having and whether they might be responsible for all or part of the current rise. The concensus that humans are responsible for all of the rise seems to be intuitive rather than scientific. I’d agree with the intuitive conclusion that humans are responsible for most of it, but that isn’t the story going out. Response. How can I word my response strongly enough? NO, NO, NO. Intuition has nothing to do with this. This is one of the best understood aspects in the entire science of climate change, and it really is not that complicated! We understand very very well why the level hasn’t (yet) reached 500 ppm. If you add CO2 to the atmosphere some of it will have to go into the ocean. This is very basic chemistry. Imagine taking a bottle filled half with water and half with pure air that has no CO2 in it. Add CO2 to the air in the bottle. Some of the CO2 will dissolve in the water, resulting in less CO2 in the air that you have originally put in. We expect this to happen, and the isotope measurements demonstrate it IS happening, and at what rate. In response to the question whether the natural sinks of carbon might compensate for the CO2 we are putting into the atmosphere, the answer is yes, but not very quickly. 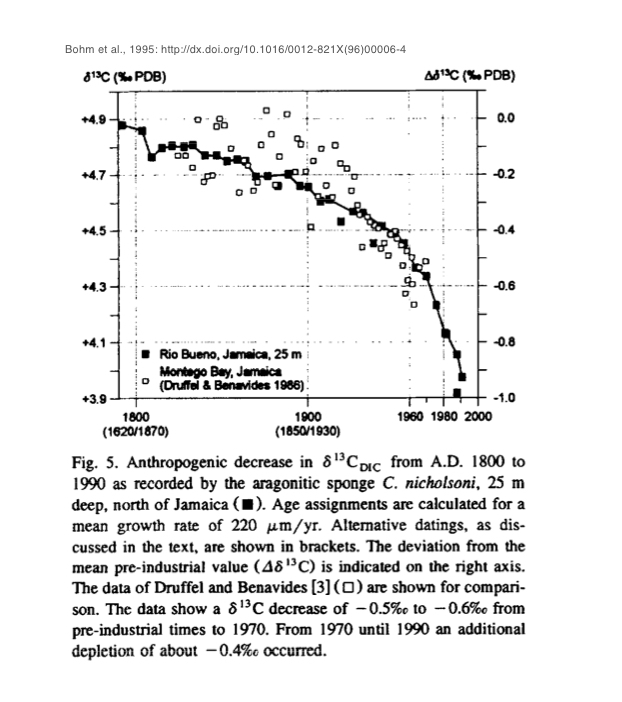 In the short term, the ocean cannot simply, magically, absorb all the excess CO2. If you try to pack all this excess CO2 in the surface ocean, it will come right back out. Again, that is what chemical equilibrium demands — there is no way around this. In the long term, the deep ocean will (probably) absorb much more of the CO2 we have put into the atmosphere, but this is the long term. If humans stopped producing CO2 today, it would take around 700 years to come back down to the original value. This is essentially because the timescale of ocean circulation is of order 1000 years. If you really want to understand the details here, the college-level textbook by Kump and others “The Earth System” would be a good place to start. Thanks for the response, eric. I hadn’t realised that the rate of absorption of all possible carbon sinks was extremely well known. Most reporting indicates that it isn’t. It seems that accurate reporting will be crucial in getting the right message across. Response You are missing the point. If it is 4:00 p.m. in Los Angeles, we don’t conclude that rush hour is just about to end just because we don’t know precisely how many cars are getting off the road. All we need to know — to accurately predict that rush hour is just beginning and that we’ll be stuck in traffic for a while — is that the number of cars getting off the road is much smaller than the number getting on. See my comment below. Just to clarify further, the point is that all of the possible important carbon sinks are well known enough that we are certain we are not going to see the carbon we put into the atmosphere disappear any time soon. The numbers we’re talking about are very large, and there are uncertainties in those numbers that are themselves large enough to be interesting scientifically. Furthermore the uncertainties are important politically, because the accounting used in Kyoto tries to give credit to countries with larger sinks (e.g. the US, which argued that the regrowth of New England forests is an important sink, which is probably true — but not enough to outweigh the US sources!). Three numbers we know well are the following (data are from Takahashi, Science, Vol 305, Issue 5682, 352-353, 16 July 2004). a) Emissions from fossil fuel combustion plus cement production is estimated to be 244 +/- 20 GT C (GT = 1 billion metric tons). b) The amount of carbon in the atmosphere that is greater than the 1850 level in the atmosphere of 165 +/- 4 GT as of 1994.
d) The ocean has taken up 118 +/- 19 GT of this carbon. If you add these numbers up, you’ll find that 100 GT +/- 60 of C has gone into new growth in the terrestrial biosphere. Calculated this way, the size of that number is quite uncertain (we know it no better than +/-60%), but it is still clearly much smaller than the amount of C that has gone into the atmosphere and ocean combined . Independent calculations of how much C has gone into the terrestrial biosphere concur with this calculation. Thanks for that eric. I didn’t like your analogy of the LA rush hour, but I take your point. I may not be as good at math as I used to be but the figure I got, from what you wrote was 101 GT +/-83 of new terrestial growth of C. Excuse my ignorance, but how does this figure being much smaller that the amount that has gone into the atmosphere and ocean (283 GT C +/-23) give certainty that all atmosphere increases are anthropogenic? And are there any offsetting additional amounts of terrestial carbon (such as new forests or plant growth, or is this accounted for in the 3rd figure?). Response The point is that more is being produced by humans than is winding up in the atmosphere and this is what we expect to happen. Sure, it is possible that not “all atmospheric increases are anthropogenic.” I never claimed otherwise. But to suggest that the natural environment has arbitrarily decided to start increasing the flux of CO2 into the atmosphere, right around the same time we are doing it is bizarre. Let me turn this around: what is the evidence that would suggest this is happening, and why? This is a dynamic system and CO2 would not be constant even without human influences. There is CO2 continually leaving the ocean and entering the atmosphere in places where ocean upwelling brings carbon-rich waters to the surface. There is CO2 entering the atmosphere from plant and animal respiration. Indeed, on an annual basis, CO2 increases during N. Hemisphere winter because plant respiration exceeds photosynthesis. The points though are that a) CO2 began to rise when we starting producing it in earnest, b) its isotopic signature demonstrates it comes predominantly from fossil fuels, and c) such an increase has not happened in at least 800,000 years as far as we can tell. As I said before, please read the scientific literature on this.